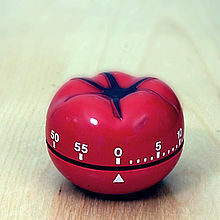 The Pomodoro Technique is a time management method developed by Francesco Cirillo in the late 1980s. The technique uses a timer to break down work into intervals, traditionally 25 minutes in length, separated by short breaks. Each interval is known as a pomodoro, from the Italian word for 'tomato', after the tomato-shaped kitchen timer that Cirillo used as a university student. The technique has been widely popularized by dozens of apps and websites providing timers and instructions. Closely related to concepts such as timeboxing and iterative and incremental development used in software design, the method has been adopted in pair programming contexts. After four pomodori (plural of pomodoro), take a longer break (15–30 minutes), reset your checkmark count to zero, then go to step 1. The stages of planning, tracking, recording, processing and visualizing are fundamental to the technique. In the planning phase, tasks are prioritized by recording them in a "To Do Today" list. This enables users to estimate the effort tasks require. As pomodori are completed, they are recorded, adding to a sense of accomplishment and providing raw data for subsequent self-observation and improvement. For the purposes of the technique, a pomodoro is the interval of time spent working. After task completion, any time remaining in the Pomodoro is devoted to overlearning. Regular breaks are taken, aiding assimilation. A short (3–5 minutes) rest separates consecutive pomodori. Four pomodori form a set. A longer (15–30 minute) rest is taken between sets. A goal of the technique is to reduce the impact of internal and external interruptions on focus and flow. A pomodoro is indivisible; when interrupted during a pomodoro, either the activity must be recorded and postponed (using the inform – negotiate – schedule – call back strategy) or the pomodoro must be abandoned. The creator and his proponents encourage a low-tech approach, using a mechanical timer, paper, and pencil. The physical act of winding the timer confirms the user's determination to start the task; ticking externalises desire to complete the task; ringing announces a break. Flow and focus become associated with these physical stimuli. The technique has inspired application software for several platforms. ^ a b c d e f g Cirillo, Francesco. The Pomodoro Technique. Retrieved 2011-05-08. ^ Cummings, Tucker. "The Pomodoro Technique: Is It Right For You?". Lifehack. Retrieved 30 December 2018. ^ Cirillo, Francesco. "The Pomodoro Technique (The Pomodoro)" (PDF). Retrieved 30 December 2018. ^ Olsen, Patricia R.; Remsik, Jim (19 September 2009). "For Writing Software, a Buddy System". The New York Times. ^ Cirillo, Francesco. "GET STARTED". The Pomodoro Technique. Retrieved 2016-01-06. 4. WHEN THE POMODORO RINGS, PUT A CHECKMARK ON A PAPER Click the "how" link and see step 4. Presumably, the piece of paper can be one's task list or similar. In any case, four check marks indicate a longer break (step 6). ^ a b Nöteberg, Staffan. Pomodoro Technique Illustrated. Raleigh, N.C: Pragmatic Bookshelf. ISBN 978-1-934356-50-0. ^ Kaufman, Josh (2011). The Personal MBA: A World-Class Business Education in a Single Volume. Penguin UK. ISBN 978-0-14-197109-4. ^ Burkeman, Oliver (2011). Help! : how to be slightly happier, slightly more successful and get a bit more done. Edinburgh: Canongate. pp. 139–140. ISBN 978-0-85786-025-5. ^ Sande, Steven (2009-11-28). "The Pomodoro Technique, or how a tomato made me more productive". Engadget. Retrieved 2018-10-27. ^ Mela, Eckenfels (2014-11-28). "Four Pomodoro tools tested". Linux Magazine. Retrieved 2018-03-22. This page was last edited on 6 April 2019, at 08:52 (UTC).